So You Want Me to Extend? My Ah Moi is due to return to Indonesia sometime February 2008. I am going to miss her dearly. She has been a comforting companion for my family. Ah Ma is pretty gullible this morning. I was rather surprised, an arrogant lady like her. She actually was making a final attempt to convince Ah Moi to go for a longer break and return and serve another 2 years with us. She must rush home speedily. Chase all the daylight she can to rejoice all the missing moments with her family, the 5 years she was absent. Strangers she had spent time to become familiar and family. Now returning, she has to rekindle love and relationship with family that has become less familiar. Ah Moi was rather polite and candid. I know she is so ready to return home to seek warmth and familiarity that she has left off. I know she will miss us too. There are many species of cili padi. Our’s boast of a nice fragrance and sinfully firery. They are so easy to grow. We have 3 plants on 3 simple pots. Barely 8 inches in height and they are fiercely budding, upwards, of course! Whoever says…don’t sweat the small stuff? What Ah Moi wants….she gets! Ah Moi wants dried chilies. From her experience, JJ stocks the best. Her exploration at the wet market has been negative. 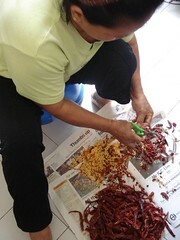 Do you know how the cili boh you buy from the market is being made? On our way to Jaya Jusco, Ah Ma was giving us an educational run down on how they are made. They will just dump and grind them without unseeding. In order to add volume to fetch higher grammage; sweet potato paste are added and thus, reducing the natural flavour and fragrance. 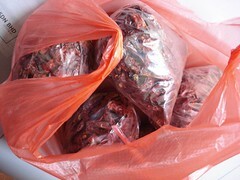 In anticipation that our cili boh in the freezer will go down to zero stock; we bought RM30 of dried chilies to prepare for a year’s ration. 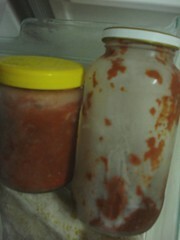 There is much to prepare to cook the chili paste. We need lots of shallots and garlics as well. This is just the preparatory stage of selecting, unseeding and cutting into smaller strips before we cleanse it through boiling it in hot water to dispel all staleness and odour. 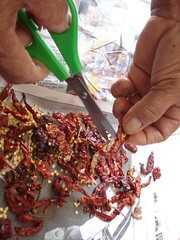 Great quality dried chilies produce great cili boh. Labour of love. Selecting only the best and unseeding. Frozen Spices. I used up half the Prego can tonight. Hot and Spicy Sambal Tumis Udang with Nasi Lemak……….. I am okay! 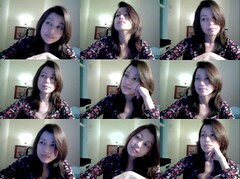 L0ve this webcamera, I can take my own photos everyday! Vain! Ken, this entry is proof to you that I am alright and kicking. Not overseas or abducted….okay? The short absence is due to a couple of reasons. Work related, personal and family. Well, it is almost the end of year and I am frantically trying to get my projections up. Not easy, I had rather do a million creative work than finished a spreadsheet! I hope you all spotted the change in the theme. No more lovey dovey with plenty of hearts. You will have to harvest them from my writings. Noticed that little sort of collie trimmed dog at the bottom of my page? I saw exactly one like that last Saturday. A colleague took me there when he heard that I was contemplating a dog as a companion. Noooooooo!I have not lost faith in a man yet but with the escalating crime, I thought a guard dog can come in useful. They don’t seem to be recovering from some fungal infection or I would not have hesitated to bring Panda home. I have very sad encounters with dogs. Our beloved, Bob died due to a long ailment. We have to put him down. Was bitten once too. The real truth, and honest truth? I cannot stand dog odour. It followed me home, not the dog …the odour. I swear it is still lingering right under my nostril . Ken, you remember my adopted sis? You can refer back to 45 for 45. She was the highlight of one of the chapters. Yup, Lee Lee and daughter; and a few cousins have been here since Saturday. As usual, when you share love, you share food. As hospitable hosts, my godbrother and I are hosting them. Adrienne is polishing and varnishing for her Godmother. It was her birthday yesterday but we got to know about it late. As redemption……a treat fit for a QUEEN! Min and Adrienne each serving a foot each….an indulgent! Pampering from hand to foot. Jian Yu surely is the most moody child I encountered. Most mornings, if we bumped into each other at the park, he would be wearing that million dollar look. Hardly could see into his eyes and tickle them to smiles. He wouldn’t submit to any threats nor sweet-talk from me. On the way out to work, Mom shouted from the bathroom that my 5Ko had fallen at the park this morning. Dropped by her house and was greeted cheerfully from this little bundle of JOY. Too bad. My battery went flat. Only managed this precious one shot. Grandma’s Green Thumb and Garden Patch has been passed down to my greatest aunty. 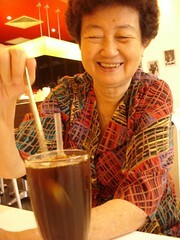 My grandma, sturdy and hardy but with the greatest disposition. Lady of very few words and spent her life dedicating to the kitchen and her garden. 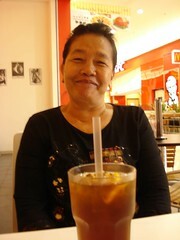 She spent her last 20 years with my aunty, her eldest daughter. They made beautiful companions; sharing life’s blessings and trials. My aunty inherited the best virtues from her. Wished my mum was any near. I guessed the most distinctive resemblance in traits would be her passion for gardening. They grew almost anything on the limited soil and pots available. 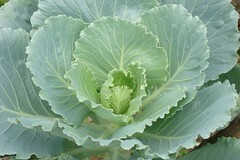 Shame on those who lament, no gardening because they did not have an acre. We grew alot of things together one holiday term when she spent time teaching me grow bittergourd, four-angled beans, long beans, corn, sweet potatoes and watermelon. 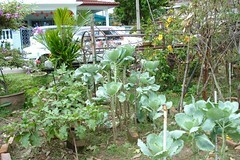 Travelling back to Malacca and w alking through my aunt’s green patch, brings back fond memories of her. Passionate Colours of Grandma in this humble Garden…. I did not noticed this pot before, funny…….we always overlook the best of people too! 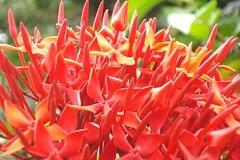 Orchids are their favourite. You can find more than 15 species here. 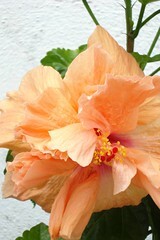 A peach hibiscus always bring a smile. They invite bees and naughty children for a nectar-sucking. Grandma may you have found the best garden in Nirwana. loving and respecting each other all these 40 years! I truly admire couples who consistently groomed their friendship and love. It takes a lot of accepting, forgiving and forgetting to stay humbly sober. There are those who have awoken. And the divide, those who are still asleep! In the wake of the recent crimes within our very own community, we are thankful for sensible and concerned individuals; who are working unconditionally to speed up security for my neighbourhood. You will laugh at the most funny responses you get…..
Utterly shocked at the price tag people put on their worth…..I believe these individuals believe that nothing bad can befallen upon them. Whatever happened to others….it was their misfortune, their negligence, their problem……and not mine! Is RM 100 too much to pay for a family for a 24 hour guarded security? When you are detached from community, you hear nothing. You live in a world of your own. You only hear your own breathing, bad breath perhaps was the reason for the seclusion. You lived in false security, pretense safety. Walking at the park, joining the committee and making new friends. Awoken your senses and audio stereo reception to everyday happenings. Strangers snooping around your streets. A small theft of sports rim to a gas cylinder tank. It gets bigger and bigger….I mean the crimes. What? The frequency of such incidences scares you! Join in together with the community to build a safer place for us to dwell in. Let us not resort to being prisoners within our own homes. Claim and guard our spaces! Shoo them bad guys out from our community. Our only chance is to commune together on this fight against crime and invasion to our own spaces! Make our community Safe and Crime Free! If we cannot make our community a safe place for ourselves, can we make it safe for our children? Every child is special….so is the mum! As critically, we judged ourselves….our children judged us too! To a child, love means differently. To a mum, love means differently, too! You are currently viewing the archives for November, 2007 at Lenscape Of My Mind.